I didn't think it possible, but Resistance blew Replica COMPLETELY out of the water. (This should already be a good enough of a reason for you to read Resistance, but if you're not fully convinced yet, continue reading!) Replica was already one heck of an amazing start to what promised to be an incredible trilogy, and because of that, I already knew that this was one series that I was going to finish no matter what. However, let me be honest here - I was fully prepared for the sequel to lose a bit of steam (because that's usually what happens to the in-between books in trilogies) but wow, that did not happen. AT ALL. Seriously. I don't even have words for how amazing and just jam-packed Resistance (and this series, in general) is! (If it isn't obvious enough with all the caps lock and the incoherent blabbing, let me say it one more time - this series is mindblowingly awesome!) It usually takes me such a long time to read both sci-fi and dystopia (and this series is a little bit of both), and I just breezed through both Replica and Resistance! As a matter of fact, I can't help hating myself for taking so long to pick up this sequel! I should have read it ages ago! I love how multidimensional the characters are. There's so much more to Nate and Nadia than just your average 'we need to take the government or higher-powers down' goal we see in every single dystopia out there. They're not your cookie-cutter perfect hero and heroines - they're like every teenager you know. They're scared, confused, they make a lot of mistakes, and while they do want to bring down the bad guys, there's always this feeling you get that these characters just want to make it out of all this mess alive. I believe that all these are what make Nate and Nadia are relateable, simply because they're not glorified as heroes who can do absolutely anything. Rather, they're realistically portrayed as two teenagers who are just doing their best to make sense of the mess that fell on their laps, and at the end of the day, hopefully do what's right. Also, like I mentioned, while the big picture remains to be ultimately righting all the wrongs Chairman Hayes has done, Nate and Nadia have their own problems to face. Nadia, now deemed a social pariah by both society and her parents, is forced to live in solitude in a retreat house with no contact to the outside world. Not only does Nadia feel the crushing loneliness at being alone most of the time, she also has the safety of her family to think of. Nate's father might have promised a truce, but Nadia knows perfectly well that she can never fully trust someone who wants her dead. You can't help but feel for Nadia in this book - she faces so much adversity, and what's most terrible is that she has no one to talk to and lean on for support. Yet despite all these, Nadia keeps her calm and never loses her focus. I don't even know how she does it! Also, it should be pointed out that while Nadia already showed just how strong she is in Replica, here in Resistance, she transcends to all sorts of jaw-dropping badassery. Not rooting for her is simply impossible. Nate, meanwhile, is not the same character we met in Replica. I still don't consider myself his biggest fan, but I can't deny how Black fleshed out his character. In fact, I would even go as far as to say that Nate has the most character growth is this series so far. Gone is the boy who always acts before he thinks, and who never stops to ponder the consequences. Instead, we have this character who takes time to think through his decisions and to think of how they will affect other people. As I have mentioned earlier, while Nate is most certainly not my favorite character in this series, that doesn't mean that I don't like reading about him, and that I do not want him to be the best guy that he can be. I'm excited to see just how much more he will develop as a character in the final book! 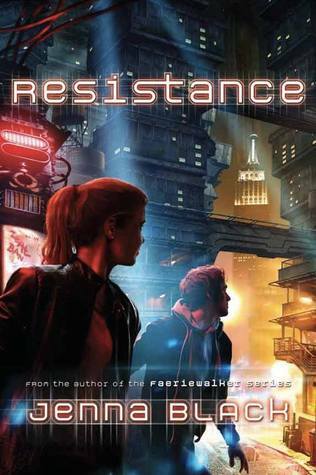 What I love the most about Resistance is that Jenna Black somehow managed to do it all - there's character development, world building, proper plot pacing, and even romance! Not one page of this book bored me, I tell you. Black expertly explores the fragile yet at the same time unwavering friendship between Nate and Nadia, the budding romance between Nadia and Dante, and the constant love of Nate and Kurt. She took her time in establishing all these different relationships between our characters, but at the same time, I never felt that romance preceded the other facets of the book - all aspects of the book are equally important, and that's something that I really like. All in all, Resistance is one book that you HAVE to read - this is sci-fi and dystopia at its finest. I had the highest of expectations for it, and it most definitely did not disappoint. I am counting down the days until I can read the final book in the series!